Dallas traffic is crazy! Just consider US Highway 75—half the time it’s a parking lot and the other half it’s a speed zone. And as the population around the DFW Metroplex grows, the problem is probably not going to subside. We hope you are never in a car accident, but if you are then knowing what to do immediately and over the long run is important. 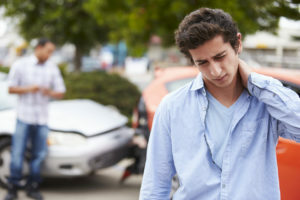 Dallas chiropractor Dr. Zinovy Chukhman would like to offer the following suggestions to make your life a little bit easier after an accident. You may feel flustered after being in a car accident. Take a minute to assess your personal safety and that of others at the scene. If there are any injuries or property damage, then immediately dial 9-1-1. Your emotions immediately after an accident may range from anger to sadness to relief. Regardless of how you are feeling emotionally, you must remain calm. Focus on documenting the accident. And don’t say anything you may regret later, such as admitting the accident was your fault. Let the investigation show who was to blame. As best you can, take time to document the accident. Use your cell phone to photograph damage to your car and to capture images of the accident scene. Write down the details of the accident while they are fresh in your memory. How fast were you going? Which direction were you traveling? You can even draw a diagram of the accident. Even if no one is injured and there isn’t any visible damage to your car or the other driver’s, you should still contact the police and file an accident report. If you need to file, the report may be needed. Even if you walk away from a car accident without a scratch—and we really hope that you do—you should still schedule a visit with Dr. Z. Many times there may be hidden injuries that don’t exhibit symptoms such as pain or discomfort until weeks later. You may be able to avoid trouble with gentle chiropractic care immediately after an accident. If you are the victim of a car wreck injury in Dallas, then Dr. Z offers a spectrum of chiropractic services to help you. Call our office today to schedule an appointment.